I mentioned way back in September(!) that I had donated Vegetarian Dinners Around the World at a school auction. I've been a bit behind on the dinners - luckily the highest bidders are good friends of ours or they would be demanding their money back! 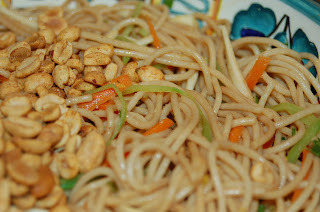 The first dinner I made for them was a noodle salad with Asian coleslaw and baked vegetable eggrolls. 1. To prepare the spicy peanuts: Combine the peanuts, oil, paprika, cayenne and salt, stirring well to coat. Place in a small baking pan and toast in a preheated 350-degree oven 10-12 minutes, until the nuts are golden. Set aside. uice, ginger, rice and sherry vinegars, sesame oil, sugar, soy sauce, jalapeno and chili oil. 3. To prepare the salad: Bring a large pan of water to the boil, add the noodles and time according to package directions. Drain well and transfer to a large bowl. Add the marinade and set aside while preparing the vegetables. 4. Bring a small pan of water to the boil; add the carrot and snow peas and time 30 seconds. Drain and rinse with cold water to stop the cooking. Pat dry and add to the noodles. 5. Add the green onions, radish and cilantro. Refrigerate if making the salad ahead. Remove from refrigeration 1 hour before serving. (Refrigeration can make the flavors less intense. Save a little of the marinade to add to the salad just before serving.) Stir in the peanuts just before serving. 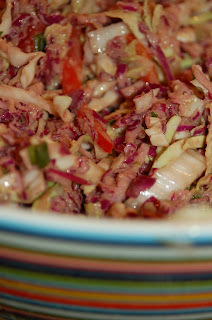 The Asian Coleslaw is a recipe I've made many times and it is pretty flexible as far as what vegetables you add. 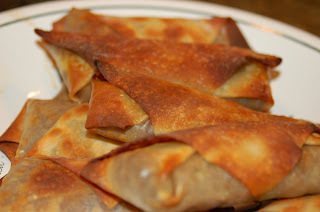 I don't remember how I made the eggrolls - I know the filling was chopped mushrooms with carrots and cabbage and other things and I baked them. Lots of help I know. But they were really good and I'm sure just about any combination of chopped veggies would be fine - I did saute the veggies first. Baking them makes them a bit chewier than a fried egg roll but it's far less guilt! I didn't get pictures of the other dinners I made. The second dinner was eggplant curry with basmati rice, spicy potato and pea samosas and raita salad of grapes and mint. The most recent dinner was spanakopita (from the Moosewood cookbook), avgolemono soup which I hadn't made in years (yes, I made it with eggs but not chicken stock), and a huge Greek salad. I still owe them a Persian dinner, Italian and Mexican. So more to come!